The other day I was thinking to myself about how difficult it’s become to stay focused for our current generation. I made it through my days at School and through my days at University. Not saying that they were easy, they were far from it! I still had distractions, but through understanding a bit about psychology/motivation and deliberate action, I’ve managed to minimize my bad habits and have successfully replaced them with good ones. How have I finally overcome procrastination? How do I wake myself up early? How do I complete the hardest tasks firsts? How do I make sure that I achieve exactly what I need to do each day, week and month? Let me tell you. There are several actions that accumulate and become habits, compounding with each other to give me and soon you the ability to overcome procrastination. 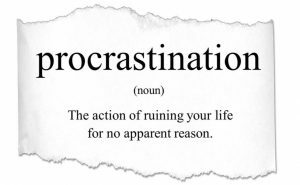 Procrastination is a human condition. Majority of people admit to putting off work and I would argue that the rest are lying or putting off giving an answer. As for putting stuff off, it’s a purely visceral, emotional reaction to something we don’t want to do. The more averse you find a task, the more likely you are to procrastinate. On a neurological level, procrastination is not the slightest bit logical — it’s the result of the emotional part of your brain, your limbic system, strong-arming the reasonable, rational part of your brain, your prefrontal cortex. The logical part of your brain surrenders the moment you choose Instagram over work, or decide to binge another episode of Keeping Up with the Kardashians instead of getting some sleep. While it’s not worth spending hours listing the costs of not going for your evening run, listing the ongoing costs will significantly help for a task such as saving for retirement. Add to your list all the ways procrastinating on retirement saving could affect your social life, finances, stress, happiness, health, and so on. In the case of Study, list the ways in which putting off study will affect you in future life. Maybe it is not getting the job you want, loss of friends, inability to complete a degree etc. Know what you want and understand how putting off certain tasks will affect you. It’s also worth while making a list of the things you put off personally and professionally, large and small, while calculating the costs of procrastination for each. By doing this you are able to learn how to evaluate yourself, by doing this consistently, you will know when you can afford to procrastinate and when you cannot afford too. This small, seemingly innocent thought contains almost every mental block that encourages procrastination. 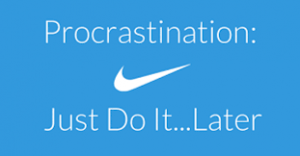 We all use the Procrastinator’s Motto (or variations of it) every once in a while. If you’re a chronic procrastinator, chances are you repeat it to yourself very frequently — daily, perhaps. 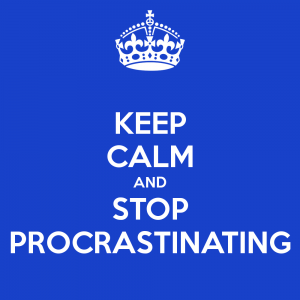 But what’s so wrong about the Procrastinator’s Motto? In what ways do these words encourage procrastination so much — and what can we do about it? Let’s consider each part of this statement in turn, replacing each of them with an empowering alternative. In doing that, we’ll turn the original motto on its head and create a productive call to action: a “Producer’s Motto”, if you like. We’ll look into how we can rephrase this statement in point 2. ‘I have to’ is every procrastinator’s favorite expression. It’s also the most dis-empowering. Every time you say to yourself that you have to do something, you imply that you don’t have any choice, that you feel forced or coerced to do the task — that you don’t really want to do it. That perception, of course, elicits a strong feeling of being victimized and resistance toward doing the task. The solution to this problem is to replace ‘I have to’ with the immensely more empowering alternative ‘I choose to’ or ‘I will’. Everything you do is ultimately a choice (yes, even completing homework or study). Using language that expresses choice reminds you of that and brings the feeling of power back. When you focus on finishing something, you direct your attention to a vague, highly idealized future. Visualizing a finished project is motivating for many people, but for someone who’s having a hard time starting a task, visualizing a hard-to-grasp future can be overwhelming — even depressing. The solution in this case, then, is not to focus on finishing, but on starting. Forget for a minute about the finish line, just concentrate on giving your first step. Bring your focus from the future to what can be done right now. We all know that if we start something enough times, we’ll eventually finish the task. Starting — all by itself — is usually sufficient to build enough momentum to keep the ball rolling. Dwelling on the size and difficulty of a looming task will overwhelm us, and this will promote procrastination. Any undertaking, no matter how daunting, can be broken down into smaller steps. The trick is — with each step along the way — to focus solely on the next, achievable chunk of work. Ignore the big picture for a while and just tackle that next small task. Make sure you can easily visualize the outcome of your small task. Don’t write a book; write a page. If it is still intimidating, commit yourself to work on it for a specific period of time. Keep the big picture in mind, of course, but don’t allow it to frighten you. Use it for motivation and direction. “This project has to impress everyone; I really can’t blow this opportunity.” Placing such high hopes on a project only adds anxiety and fear of failure. Perfectionism fuels procrastination. Overcome this mental block by simply giving yourself permission to be human. Allow yourself to be imperfect with the next small task. You can always refine your work later. If you’re a serial perfectionist, go one step further and commit yourself to doing a sloppy job on purpose — at least at first. Instead of making every step perfect, think of them as steps toward perfection. For instance, write a page or two now, then proofread and correct them later. Our devices offer a mass of distractions, whether it’s email, social media, or texting with friends and family. This is especially difficult as our work becomes more ambiguous and unstructured (two triggers of procrastination). When you notice yourself using your device to procrastinate, disconnect. Sometimes when I’m writing, I go as far as to put my phone in another room, and shut off the WiFi on my computer. Other times, I turn to an app like Freedom or Self Control, which blocks access to distracting sites, and require me to physically restart my computer to restore access. This may sound drastic, and it is. Disabling digital distractions ahead of time gives you no choice but to study on what’s really important. Counter-intuitively, working less can help your productivity over the long-term. But it’s surprisingly hard to study less, especially when you need it. It’s hard, in part, because we haven’t evolved to know exactly how much we need to study or how much we can obtain when learning. Meditation helps you become aware of your thoughts. Becoming aware of your thoughts is an essential step to ignoring the thoughts which aren’t useful. Focus your attention on your breath. Be aware of the thoughts that are flowing in your head that lead you to procrastination. Don’t try to make the thoughts go away. Don’t feel guilty for having them. Just acknowledge that they are present in your mind. Say “hello” to the thoughts. Then, choose the best course of action… and study! I Meditate daily and it’s made a huge difference in my life. I’d recommend a mobile app such as Headspace or Calm to get you started. Your to-do list should only consist of your top 3-5 goals/tasks that you need to complete. Delete from your to-do list those things that don’t relate to those goals/tasks. Just say bye bye. And don’t look back! This is important to better manage your time because with limited time, it’s important to do only things that matter most, but not every single task at hand (especially with all the potential distractions). All your friend has to do is sit in the room with you and make sure that you do the task, or if they are a really good friend, they can help. After the task is done, you can treat you and your friend to either coffee, dessert, meal or a movie, whatever! Majority of people do not have any reliable structure in their days that make it easy to be disciplined. Instead, they rely on either motivation, inspiration or willpower. We watch motivational videos and try to get inspired by our favorite movie or pictures of celebrities on Instagram, only to realize that this motivation is short-lived and fizzles out quickly. The amount of times I have watched Gary Vaynerchuk and been ready to build a company in a matter of seconds is way too many to count! I assume it is the same with Homework or Study, you are pumped to complete it once you have seen someone talk about completing it or actually doing it like Dr. Woo (we love him at Intellecquity! ), you want to go and try it yourself. What you need to realize is that the order of these concepts is actually the other way around. Motivation and inspiration are created by action. You do something, you start to feel inspired and then the motivation kicks in. Have you ever had a day when you struggled with whether you should e.g. go to the gym or for a run? Tired, exhausted after work, dark and rainy outside there was no motivation and you could find any excuse to stay in. But maybe you didn’t. Maybe it was a friend who pushed you or maybe your bag was already packed and you just went anyway, regardless of your resistance. Do you remember the amazing feeling you had after your workout? How motivated you felt to do it again, every time? For Example, remember the first time you figured out the methodology to complete a solution? You got this rush of blood and wanted to smash out the rest of the homework… That is Action leading into Inspiration and Motivation. This is motivation as a result of the action you took. So how do we make sure we take action even if we are not motivated? You have to think about willpower or discipline. Willpower is somewhat like a muscle, a source of energy that depletes over time. Relying only on willpower could serve in the very beginning of a new project when motivation is still very high. Whatever goal you have set for yourself, you are excited to give it a shot and eagerly do the first steps. Over time, however, your willpower will decrease. This depletion can be seen over the course of several days and weeks, but also in a single day, as your willpower starts off high in the morning and declines towards the evening. At this point it will be very difficult to pack your bag for the gym, to resist that delicious pizza around the corner, or to finish that book instead of wasting time on social media. You then wonder why you don’t have any self-discipline. So both motivation and willpower are actually rather low ranking traits on the scale of consistency and productivity. Willpower: As described, having good levels of willpower can be useful to make yourself do something and overcome laziness. However, just like motivation, willpower is unreliable, so this is actually the lowest level of productivity and consistency. Discipline: Discipline implies that you have to bring up a certain degree of willpower to overcome laziness. It is better than sheer willpower alone because you regularly bring up that willpower and get used to doing it, especially if you don’t feel like it. However, it’s not reliable either, since on some days you manage to discipline yourself, on others you don’t. Habits: Habits are the cornerstone of consistency. You shift from conscious effort and willpower to implementing habits that take over and run on autopilot. The key is to implement habits by designing your environment and it will be easier to actually stick to them and make them a part of your day. Identity: This is the ultimate level of consistency. It is an evolution of habits. Once you are consistent with your habit for a long period of time, these habits will turn into your identity. It will not be a habit for you to e.g. go to the gym, you simply will go to the gym no matter what because you are a person who goes to the gym. At the last stage, there will be no questioning, no laziness, you literally just do it. You would have to use willpower to not do it. Whatever goal you have. Don’t think of the result, but rather the kind of person you have to become and the tiny steps that are needed to get there. Look back on the effective strategies above and become the person that takes action to inspire and motivate. Reading some pages, doing some minutes of exercise, cooking a healthy meal yourself… taking small steps in the right direction on a daily basis establishes lasting habits that will ultimately shape your identity. How do I actually stick to my habits? By making it easy to stick to them through intelligent design of your environment. A good example of how to use Environmental Design is your phone. The first thing many people do after waking up is to reach for their smartphone and check messages, e-mails or notifications from social media. This sets you in a reactive state and will prevent you from focusing on your true priorities. Therefore, before study, intelligently design your environment. Put your phone in airplane mode and place it somewhere impossible to reach from your desk. Prepare your to-do list with the three most important things you want to achieve and place it somewhere you can see it as soon as you sit at your desk. After completing your study, you can directly focus on rewards or other priorities that lie ahead. Should you still instinctively reach for your phone, there will be no distractions available due to the airplane mode. This has taken me roughly a week to complete. Gathering resources, finding information and collating this to make sure that it is fit for my readers. What did I learn? That I didn’t waste any time, I stuck to my schedule and didn’t miss a single second of my writing because of procrastination. Stop waiting until the last minute to do what you need to do. Procrastination adds stress and often leads to lower-quality work. Start doing the things that you know you need to do in order to achieve your long-term goals. You’ll be glad you did three years from now, maybe at your dream job. But remember, sometimes procrastinating is a rational strategy. Sometimes, it’s best to do more than just wait. When you’re not living in line with your values or you’re taking on too much study, it’s best to break it down and start. Think critically about whether you should procrastinate, do what you need to do, or develop a new plan. Understand that it’s the habits that will drive you towards less procrastination. Habits such as putting your phone on airplane mode when you’re studying, taking regular breaks and rewarding yourself. The Best College Towns to Live in! Get the Math help you need to finish your homework.